Bow has been a part of the human history for at least 15.000 years. Within all these millenia bow has been shot with various pull-and-release techniques, that appearently varied from one culture to another. Thumb release is a general term that is preferred by contemporary authors. It defines a pull-and-release technique at which the major work is done by the thumb and the other fingers of the hand are also involved in reinforcing the hold. This is different than the pinch or “primary” draw and its variations, as called “secondary draw” and “tertiery draw” by Edward Morse. Morse’s preference in naming this technique was “Mongolian release” which in fact did not belong to Mongols and the “common races” as he mistakenly believed. Such a race-based classification was considered normal among the European scholars of the late 19th century. It was just 21 years before the publication of Charles Darwin’s famous book, “On the Origin of Species”. This book did not only shake the scientific world but had its influence also on people’s minds. Fed by philosophies like “Social Darvinism” this intellectual environement made the nationalist tendencies grow and a few decades later ignited the II. World War. Thumb release is a modern term and is more accurate. Its accuracy is firstly due to this technique’s wider distribution on the globe. Hence, even in Africa and America traces of different forms of thumb release can be found. Turkish traditional archery is exceptional with its many aspects and Turkish archers too shot with thumb release in their entire history. Despite the insufficient evidence about very early use of thumb release in Turkic culture, for instance by Xiung-nu, Huns and Blue Turks, Seljuk archers did shot with this technique, as can be seen in many depictions and as supported by some written sources. The Manzikert Battle between the Byzantine army under the commendement of Romanos Diogenes and the Seljuk army led by Sultan Alp Arslan ended up with the victory of Seljuks. It was 1071, just 31 years after Alp Arslan’s father and uncle had defeated Ghaznavid army and founded an empire that was going to rule in Iran, Irak and Syria. The young empire’s military success against the enormous Byzantine army and the renowned general has been analyzed throughly by historians. Together with many other factors Seljuks’ skill with bow and arrow is considered to be one of the reasons of victory. Neither Romanos’ experience acquired in the war against Turkic tribes of Pechenek and Uz nor these minorities that were on duty in the Byzantine army helped to avoid the successful application of typical nomadic tactics and strategies on the battlefield. Seljuk Sultanate begins in early 11th century. It makes sense to believe that the rise of the Seljuk Empire played a significant role in triggering the Crusades. Alexios’ call to the Pope for being help in stopping the “Saracens” coming to Anatolia from the East, was undoublty a factor. The less-known part of this history by Europeans is that it was the Seljuks who encountered the first Crusade armies and later closed the land route to Jerusalem. Although the very first “People’s Crusade” army was completely destroyed by Sultan Kilij Arslan in 1096, the second army consisted of well-trained and armored knights were able to defeat him a year later, in a battle called “Dorylaion”, referring to an ancient city that is close to Eskisehir in modern day Turkey. This Crusaders have been the only who arrived Jerusalem following a land route. Kilij Arslan was a leader who learns from his mistakes, so he didn’t underestimate the following three armies that came in 1101. Allied with his eastern Turkish neighbour Danishmend Gazi, he destroyed all of them and only a few knights could survive. 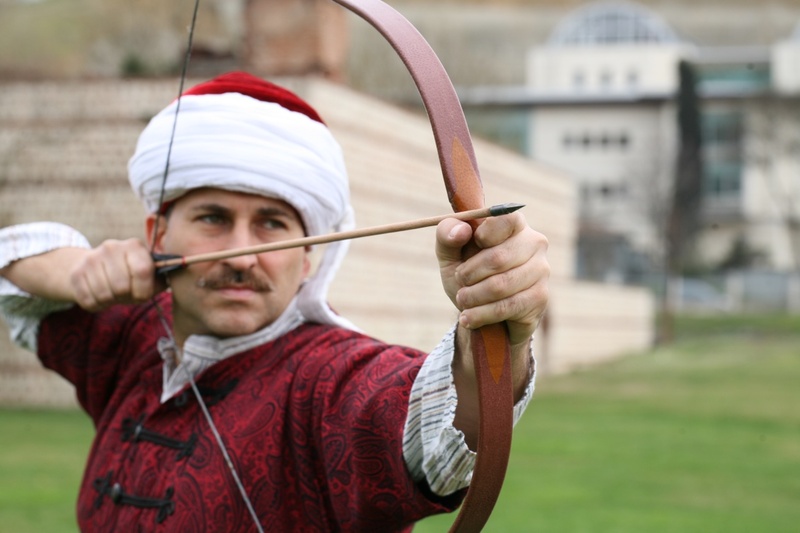 Crusader chronicals report the amazing archery skills of Seljuks during these confrontations. They did not hesitate to appreciate the enemy’s unusual martial skills; long-lasting showers of well-aimed arrows shot from surprisingly long distances, together with a flexible and mobile warfare. Seljuks were mounted warriors who preferred fast attack-and-retreats rather than a face-to-face, impact-based combat. They were steppe people who had been thoughened under the hard living conditions of the steppes. Bow was their main weapon and archery training was starting in early childhood, as early as 4 years of age. Being brilliant archers and riders they shot an exceptional bow: recurved, reflex Asian composite bow. Undoubtly the bow played an important role in their performance on the battlefield but another important factor was how it was shot: thumb release! 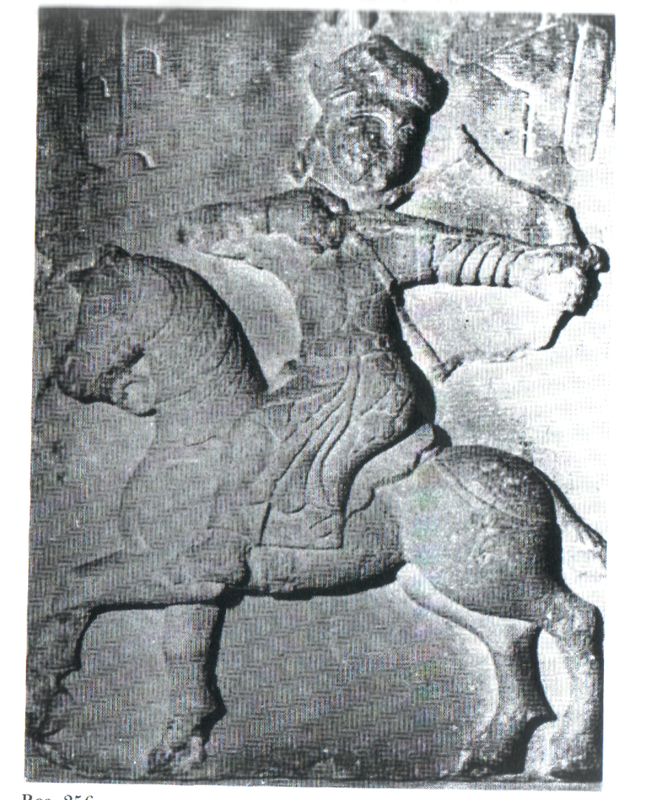 A relief, now in Armenia, depicting a Seljuk mounted archer who is executing the “Parthian shot”. Shooting backwards from on horseback was the Everest of nomadic warrior’s martial art. After hundred of years Ottoman archers were going to reach unsurpassed distances in flight archery. They were going to have an evolved version of Asian recurve-reflex bow in their hands and thumb release was going to play one of the lead roles again. There are some advantages that this technique provides. Since the archer’s paradox occurs towards the “opposite” direction compared to that happens with Meditarrenean release, the bow is “loaded” from the right side. This way the arrow follows a direct, shorter and flawless path to the string. Therefore nocking the arrows is faster. The string hand is closed in a special manner to form a lock (“mun-dull” in Turkish), so the arrow is held in place with a slight pressure of the index finger. It causes a great stability during entire shot sequence. The archer pulls and releases comfortably, on foot or horseback, backwards, in kneeling positions, with the bow canted any direction, at any angle. 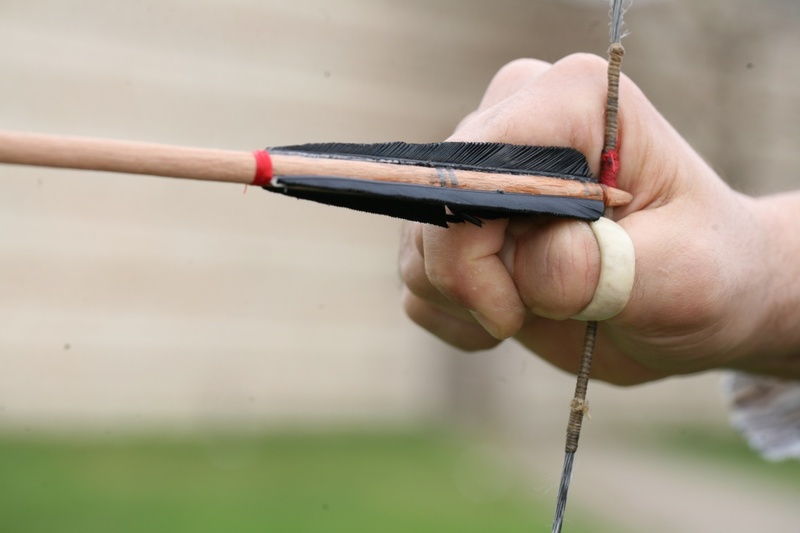 Unlike when shot with three fingers the string hand can hold some extra arrows that can be nocked and shot faster consecutively. During the shot the archer’s paradox occurs not only towards the opposite direction but also in a less acute manner, i.e. the arrow shaft bends less. It makes a wider spectrum of spine values match a particular bow. Practically, some other arrow found on the battlefield can be shot with better accuracy in case of need. Another advantage of less-bending shafts is supposed to be a decrease of enery lost and to reach a higher initial arrow speed. We tested this assumption by chronographing shots executed with thumb- and Mediterranean release. In this short study two experienced thumb shooters and one experienced finger shooter were involved. We used a 55#@28, all-resin Ottoman bow replica and shot two arrows weighing 513 grains and 422 grains. The result was an increase of 6,5% in initial velocity when the thumb release is executed with a well-made, rigid thumbring. Calculation of the kinetic energy resulted an increase of 12,29%. In combat or hunting situations in which every bit of energy counts, this difference may be of great importance. The Turkish term for the lock of the string hand, mandal, or mun-dull as would be spelled in English (Photo: Suat Gürsoy). The arrow is on the “right side” of the bow due to the opposite direction of the archer’s paradox (Photo: Suat Gürsoy). “Jarmakee” or “fard or qırat” is a very unusual shooting technique to shoot at a target in a well or cistern. It works also in predator hunts when the “prey” charges the hunter and hangs up the horse’s back (Photo: Suat Gürsoy). Bow shooting techniques evolved with the needs and demands of people who used it. Short composite bows and thumb release created their own technical extensions and variations as well as accessories. One of the variations is worth to mention, especially because it shows what a flexibility thumb release would provide and because European archers are unfamiliar to this shooting technique. 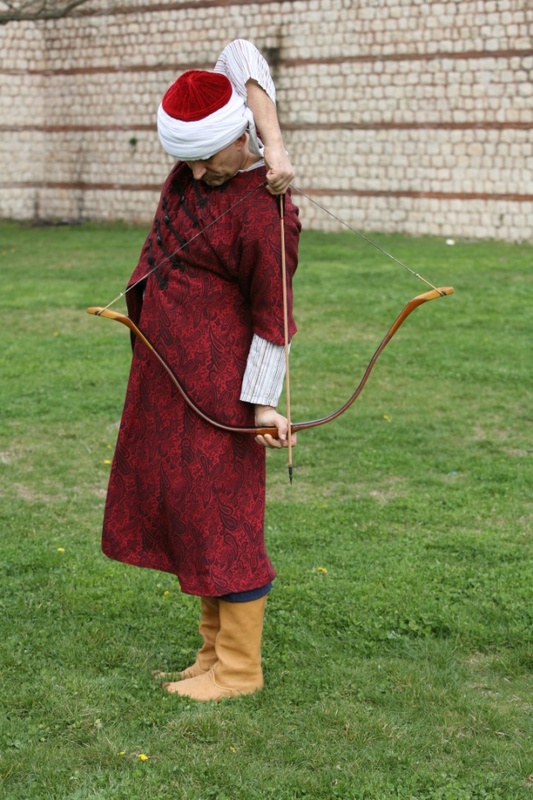 This interesting technique is called “fard or qirat” or “jarmakee” in eastern sources and enables the archer shoot at targets in a well, cistern or in a narrow, deep place. The string is drawn over the head, brought back to the neck, the bow is pushed downwards the arrow pointing straight down. In regular practice, the target should be just next to the left heel of a right-handed archer. It is mentioned that this technique is also for shooting a lion that would attack a mounted hunter and suspend on the horse’s back. This explanation makes sense when the typical Central Asian and Middle Eastern mounted drive hunts are considered. Composite bows and horses have been like two halves of a whole for centuries. Thumb release existed in the scene all the time. The synergy they created wrote the military history until the age of firearms came. Sounds of horseshoes of Attila’s Huns, Chingis Khan’s Mongols, Ottoman sultans’ sipahis became the worst nightmare in the land they conquered. Ottoman army kept an archery detachment until 1790. 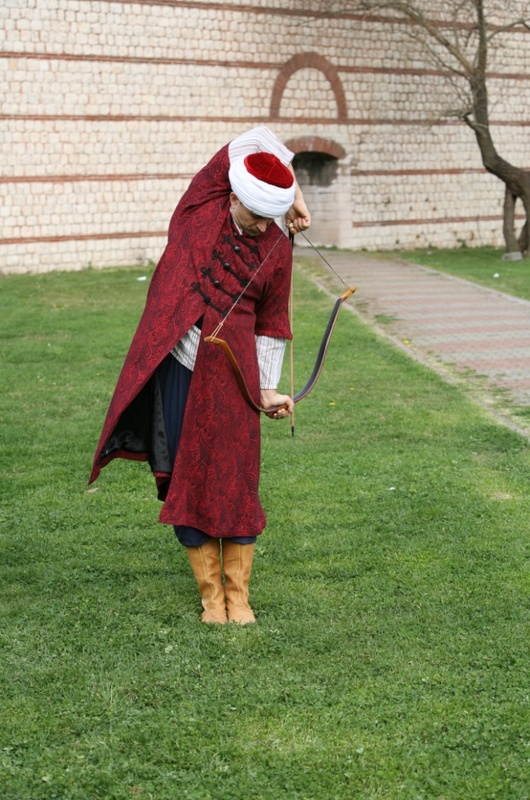 The guards of the sultan, the Solak Troops, did not leave their bow and arrows until the frst quarter of 18th century. Today, we proudly keep the inheritage of Turkish archery live, with the hope of passing the torch to the next generations.